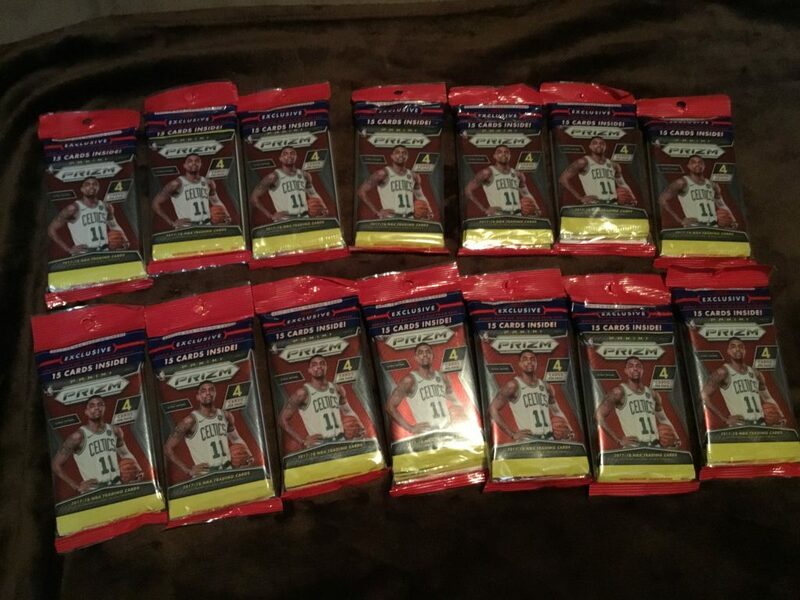 2017-18 Prizm basketball cards were released in mid December of 2017. Since the day it was released, I have been to my local Walmart and Target stores so much that the employees probably think I was hired. I thought searching for this product would not be hard to find because I am in a larger area south of Seattle and we have 2 Walmarts and 2 Targets in our town alone. Not The Case! I had searched and searched with no luck. I don’t know if there are other collectors that have an inside track on when these stores restock or not, but every time I would go look there were no Prizm at all. But over New Year’s Eve weekend I finally hit the jackpot at the local Target. I entered the store not expecting anything as usual. As my eyes scanned all the racing card blasters and other product I have no interest in…I SPOTTED THEM!!! 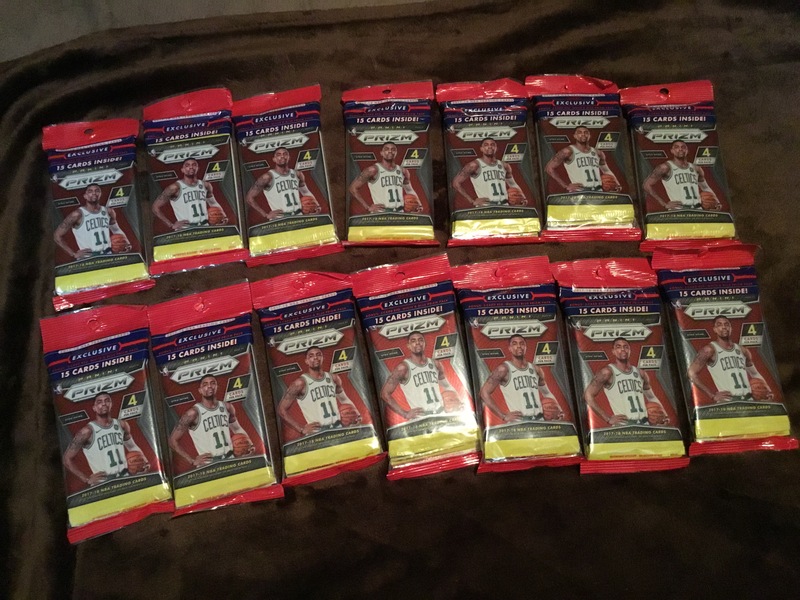 Hanging on the racks were 14 packs of 2017-18 Prizm Basketball retail cello packs!! I think I may have pulled an arm muscle from reaching up and grabbing these off the racks so fast. The funny part about this is that I have not even opened the packs yet. I think I will just keep them sealed and hang onto them for a while. These same packs sell for between $15-$20 on eBay. It was nice getting them at the SRP of $10 a pack. The reason I will not open these? I believe over time these could be a real sought after unopened product because this 2017 NBA Draft class appears to be loaded with talent. The list of rookie players from this draft that are playing well is impressive. Players like Dennis Smith, Jr, Kyle Kuzma, Donovan Mitchell, Lonzo Ball, Lauri Markkanen, Jordan Bell, Justin Jackson, Josh Hart, Jayson Tatum, John Collins, Jonathan Issac, Josh Jackson, Frank Ntilikina, Malik Monk, OG Anunoby, and DeAaron Fox (He is battling an injury right now). And the #1 Draft pick, Markelle Fultz, hasn’t even played yet in 2017-18 because of an injury. So yeah, it is safe to say that this Draft class is loaded with potential. Only time will tell where the 2017 NBA Draft class stacks up to other drafts, but right now it is on the right path for sure.